I am Pam Hogue and I am the principal at Weiner Elementary School. I am thrilled to be part of this school family and am so very proud of the school that we have created here. Being an Arkansas School of Innovation is a special part of who we are and I believe that we are providing our students with an education that will not only make them ready for the world - but knowledgeable of our world. As an educator, the SOI gives me the opportunity to reach kids on a whole new level. As a parent, the curriculum at WES is exactly what I would look for in a school for my own child! I have worked for the past 30 years as a teacher, counselor and administrator in Weiner Schools. I have worked in both Weiner Elementary and High School and am excited to have the opportunity to stay in and work with the community that I love. Weiner is my home and has been all of my life. My husband, Lewis, and I live in the city of Weiner and are active in our church and community. We are both graduates of Weiner High School and have two grown sons who are WHS alumni. We also have a daughter who is a student at Weiner Elementary School. As the principal, my goal is to make WES a great place for kids to grow and learn and a place where parents and community feel welcome. I work with an amazing staff and their commitment to students is the same as mine. Please feel free to contact me at my office (684-2252) or by email at phogue@hbgsd.org. Representing and talking about Weiner Elementary School, Harrisburg School District, and my great school family is one of my favorite things to do. This past year I had the opportunity to do just that on both the state and national stage. As part of the National Blue Ribbon Schools Program, principals from awarded school may be nominated for the Terrel H. Bell Award for Outstanding Leadership. I was nominated and selected as a 2016 recipient of this award! To be recognized as one of seven in the nation who were given this honor by the United States Department of Education is humbling to say the least. 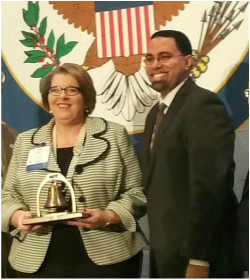 As I told the Secretary of Education, it is definitely my school family that deserves any award! Pictured with me below is John B. King, Jr., past Secretary of Education. You may see my profile from the U.S. Department of Education page here. This past spring, I received quite a shock at morning assembly when representatives from the Arkansas Association of Educational Administrators and the Arkansas Association of Elementary School Principals surprised me with the Above and Beyond Service Award. Pictured below is the plaque for this award. To summarize, this award is given for loving kids and a school - something that is very, very easy for me to do! Again, I am so very thankful for the people that I get to work with every single day and for our school district and community for supporting Weiner Elementary and me in loving our kids!